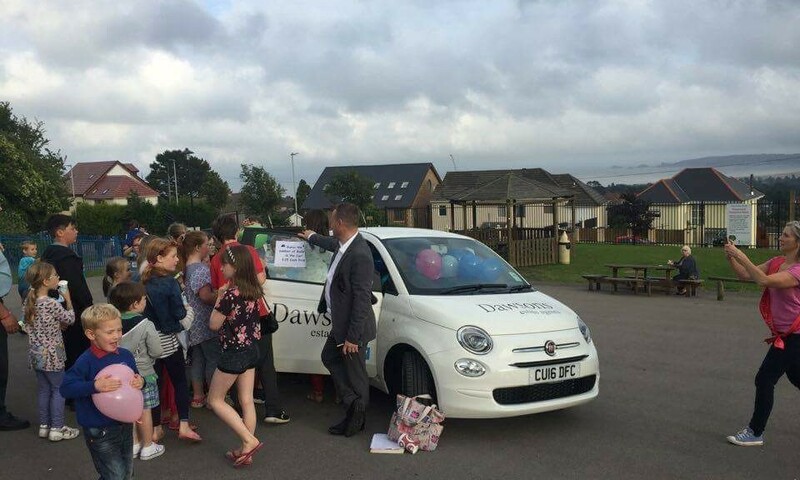 Photo Caption: Children at Sketty Primary surround the Dawsons’ car as they try to figure out how many balloons were inside? Leading estate agent Dawsons is no stranger to pledging their support to the local community, and after running a number of fundraisers in recent months for their chosen charity The Wallich, the firm turned its attention to Sketty School. The school is close to many staff member’s hearts, in fact Dawsons’ very own Dan Guttery sits on its board of governors, and with the school’s summer fair coming up, he spied an opportunity to introduce some great family fun and raise essential funds in the same breath. “The Sketty School Summer Fair is always a great day out and this year’s event was no exception. I came up with an idea that would help raise funds during the fair and offer something different for all who attended. Children were invited to guess the number of balloons in the car and whoever guessed correctly or closest won a prize. Overall the day was a great success, the weather held off and the ‘guess the number of balloons’ competition was a definite hit,” said Dan, who works in the lettings department at Dawsons’ Walter Road office. The Dawsons’ balloon car competition cost £1 to enter and the winner won £25. The car contained 165 balloons and though competitors did not guess the exact total, the lucky winner’s guess was 161. The summer fair was held on school grounds this month and was organised by the Parent-Teacher Association (PTA). With funds available to local schools considerably less than years gone by, ideas and events like these are being used to make up some of the shortfall. Money raised at previous fairs has supported various projects at Sketty School, including the creation of a new library, and the purchase of musical instruments and playground equipment. A spokesperson for the PTA said: “Fundraising is an essential part of the PTA’s role and we make a significant contribution to the school’s activities. So far this year we have funded £1000 per for the teachers to spend on sundries such as paint, paper, and other materials for crafts. Also, Annual school membership for Techniquest, the marking of the netball court, purchase of table tennis tables and an “Explorer’s Shed” for Years 1 & 2 and finally funding of the school’s Active Learn Reading Scheme. “It is fantastic that we are able to support these local events, and we do so in any way possible as they are such important causes. I know the fair was a great success, and hopefully our small involvement helped on the day,” concluded Ricky Purdy, Director of Residential Lettings. After winning the title of Wales Lettings Agency of the Year at The Lettings Agency of the Year Awards 2016, independent estate agent Dawsons has gone from strength to strength. 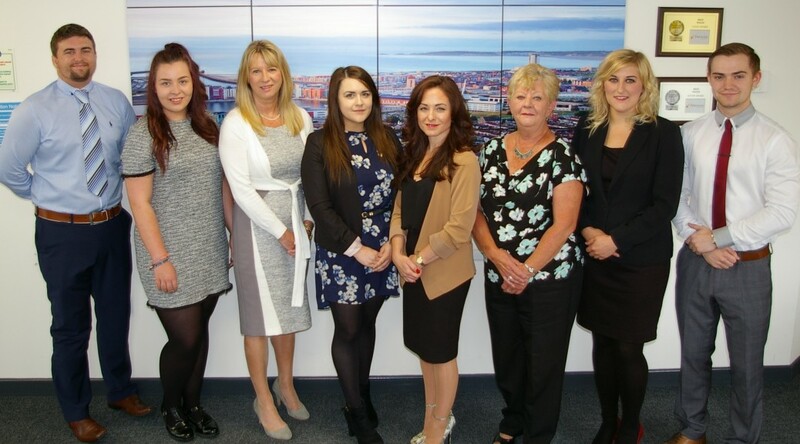 In recent months the firm, which has eight sales branches throughout Swansea and south west Wales offering a wide range of property services, has made a number of new appointments. Dawsons is pleased to announce two new additions, Robyn Lewis and Dafydd Spear. “Robyn joins our highly successful auction department bringing a wealth of experience, boundless energy and enthusiasm, three factors that mean Robyn can easily and confidently handle any residential or commercial property queries. With a very broad knowledge of the housing market and experience spanning a number of years in the industry we also welcome Dafydd to complement our very busy Morriston team,” said Joanne Summerfield-Talbot, Director of Residential Sales at Dawsons. It’s not just new team members that Dawsons is celebrating, there has also been a variety of promotions and moves affecting current staff. Emma Bolton has transferred from the firm’s successful Marina branch, where she worked in sales and lettings, to their Mumbles branch to take on the role of Branch Manager. Emma’s drive, determination, energy, and vast knowledge and experience in the housing market makes her the perfect staff member for the job.